Today is a very important date for the worldwide Salesian community: The Feast of St. John Bosco,founder of the Salesians. This day will be celebrated in over 130 countries around the world where the Salesian Congregation is working. We would like to wish you all a Happy Feast Day!! Please click on this link to access the Mock Exam Timetable. It's with great sadness that we share the news of Cody Courtney Cross' passing. Cody was a student in Salesian College Celbridge who completed his Leaving Certificate in June 2018. Cody represented the school in hurling and played for Ardclough GAA Club. ​Our sympathies and prayers are with his family and friends at this difficult time. ​Ar Dheis Dé go rabh a anam. The school will be closed this Thursday, 29th November to all students due to staff in-service on the New Junior Certificate. The registration deadline for first year students wishing to start in September 2019 is Friday, 23rd November at 12 noon. Please ensure forms are filled in completely as incomplete forms will not be accepted. We look forward to this wonderful wholeschool event. It is scheduled for tomorrow,Thursday 25th October at 2.00pm. We wish all our students the very best of luck and we encourage all our students to participate. There will be prizes for the individual winners for each year group as well as the overall winners. We would like to invite parents and past students to attend and support this unique event. Please support and encourage our runners around the route. Salesian College is not a public transport hub for public transport to the Phoenix park. There is a public bus stop outside the school on the Maynooth Road, but the school is not part of the Dept of Transport arrangements.There is no parking available on the school premises. Final uniform sale and opportunity to exchange jumpers sold in June this Thursday 23rd from 6.30pm to 7.30pm. We sincerely apologise for the changes of dates this summer. We have had issues with our suppliers and have had no option but to change the dates. Jumpers sold in June of the lighter yarn must be exchanged. If there are any issues regarding washing or durability if not returned there will be no come back or liability on the school. I sincerely thank also the Parents Association for their assistance and organisation of the sales. The school is in a position to offer financial assistance to parents / guardians / families towards the costs of returning to school. ​Parents / Guardians who purchased jumpers in June may have noticed a difference in the weight and knit of the jumper. This was only noticed when the jumpers were laid out for the sale. We notified our suppliers that there was a difference in the quality of the new delivery we received this year. Our suppliers have agreed to revert to the original knit / yarn. We expect this delivery in the next few weeks, hence the change of the date for the uniform sale. Therefore we will exchange these jumpers at the sales. Please return with the plastic bag and we request you submit your receipt as well if possible. We sadly announce the death of Br.Pádraic McDonald, School Chaplain, 2002-2008. Br.Pádraic was a popular member of staff and was well liked and loved by the students of Salesian College. We share our sympathies and condolences with all the members of the Salesian Community in Celbridge and also in Pallaskenry and Castletroy, Limerick. Ar Dheis Dé go rabh a anam. Salesian College will close for the summer holidays from Monday 25th June until Monday 20th August. Parents and guardians can view and download book lists, the book grant form and the "Enrolment Check & School Charge" form. This information is available under the School Office menu. We sincerely thank the parents and students and teachers who very generously helped us this morning clearing the school and all the parents who assisted us with contacts for diggers and JCBs! We are open tomorrow as normal although we advise all students to travel carefully to school and be cautious on the paths and be visible. We wish all our students a Happy New Year and we hope that they will continue to work to the very best of their abilities. I ask you to read this letter carefully as there is important information about school systems and news for your attention. The school will be closed this Tuesday, 23rd January to all students due to staff in-service on the New Junior Certificate. Many congratulations to Odhrán Brady (TY student) who has qualified to compete in the BT Young Scientist & Technology Exhibition this week with his project: "Quantifying Whiplash : An IoT Sensoring Approach To Help Reduce Insurance Claims Costs". We are very proud of Odhrán and wish him the very best of luck at the exhibition. Non-Uniform Day in Salesian College this Friday 15th December in aid of SVP Celbridge - we're asking all students to wear their Christmas Jumpers / hats and donate €2 each to this worthy charity - Let's make Christmas a little brighter for someone in our community!!!! We are delighted to announce that one of our 6th year students from last year has been awarded a national award for Engineering. At an awards ceremony in Letterkenny Co. Donegal Gearóid O’Connor was presented with The Young Engineers Award for his work in Leaving Certificate higher level Engineering. Due to unforeseen circumstances, the digger that we had organised for tomorrow is not available due to technical problems. We would be most obliged if any parent or guardian could pass on information to the school regarding a possible contact for a digger / JCB for tomorrow. Following a health and safety check of the school grounds, entrances and exits and pathways between the school buildings, and following some minor exterior damage it is not safe to open the school tomorrow for students and staff. The height and impacted nature of the snow drifts means we have to engage a mechanical digger / JCB to clear the large levels of snow and ice. This has been arranged for tomorrow morning. We call upon our students and parents if you can assist us tomorrow morning from 10.00am to clear the access areas in advance of the digger coming in, your assistance will be gratefully appreciated. Please bring a spade or snow shovel. Thank you. It is our aim to clear the snow tomorrow with a view to opening on Tuesday morning for a normal school day. The scheduled second year retreat will not go ahead and we have postponed the Senior Subjects Choice Information Meeting to Tuesday 13th March. Our In-coming 1st Year Information Meeting will go ahead on Thursday as well as the exams on Saturday 10th. We fully appreciate that all parents,students and staff are anxious to return to school and normality, but given the nature of the snow drifts it is not safe nor feasible to open tomorrow. ​We thank you for your understanding on this. Please note that the weather situation will be reviewed on Sunday and students and parents will be notified on Sunday what the situation is. Please note that Salesian College will remain closed tomorrow, 1st March and Friday, 2nd March due to adverse weather. The school is closed today due to safety concerns given the red alert weather warning. The school will be closed this Monday, 4th December to all students due to staff in-service on the New Junior Certificate. We would like to thank everyone who came along to see our school last Saturday during our Open Day. We hope you enjoyed the tour of our school. We would also like to congratulate all the teachers, students and the Parents' Association who came in to help out during the day. Their support is greatly appreciated and valued. To view some of the photos from our Open Day please go to the Gallery or click the link below. 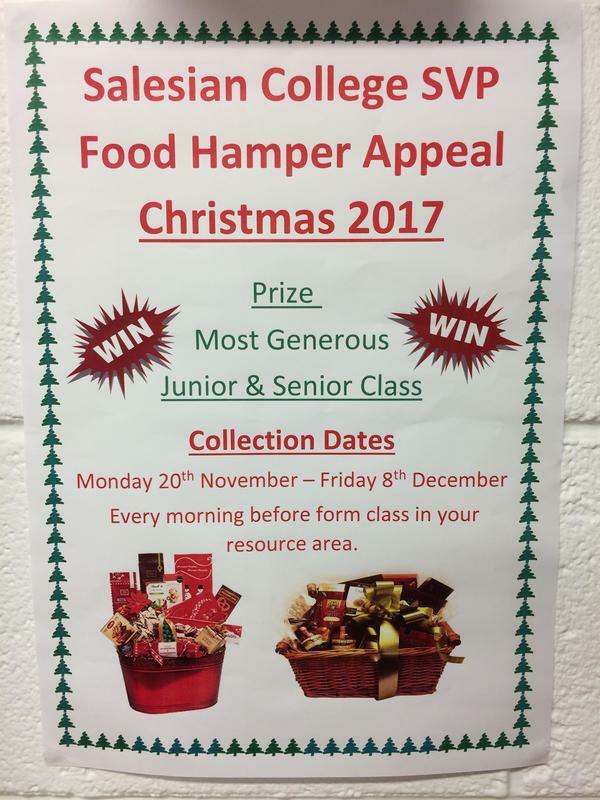 Salesian College's Patrick 6 are organising a Food Hamper Appeal for SVP this Christmas - we're asking all students to donate whatever non-perishable items (pasta, rice, cereals, biscuits, crisps, tins of fruit etc) they can to this fantastic cause. The collection will take place every morning in the Resource Areas from Monday 20th November to Friday 8th December. Let's make Christmas a little brighter for those in need by showing that in Salesian College 'We care, develop and believe - together we achieve'. Many congratulations to Odhrán Brady (TY student) who has qualified to compete in the BT Young Scientist & Technology Exhibition in January 2018 with his project: "Quantifying Whiplash : An IoT Sensoring Approach To Help Reduce Insurance Claims Costs"
Science Week 2017 takes place from 12-19 November. Celebrate the fascinating worlds of science, technology, engineering and mathematics (STEM) during Science Week. Night Study for 3rd and 6th year students is up and running. There are still places available for any student looking for somewhere quiet to study. Night Study runs 7pm-9pm from Monday to Thursday and 5pm-7pm on Fridays. Please contact Mr. Kilcline or Mr. Kerins for an application form. We look forward to this wonderful wholeschool event. It is scheduled for Thursday 26th 2.00pm. We wish all our students the very best of luck and we encourage all our students to participate. There will be prizes for the individual winners for each year group as well as the overall winners. The Parents Association Meeting will take place on Tuesday 3rd October. All students will be issued with the letter below from the Parents Association on Wednesday 27th September. As directed by the Department of Education and Skills, Salesian College will remain closed tomorrow Tuesday 17th October. Due to the weather warning, the Department of Education and Skills has formally announced that all schools should be closed tomorrow Monday 16th October. We will update students, parents and staff as the day progresses. In the interest of health and safety for all, all students are asked not to attend school tomorrow and we advise all students to study and work at home.Thank you. Due to unforeseen circumstances we must reschedule this meeting. We apologise for any inconvenience. Please click on the link below to read this letter regarding our new weekly schedule, school calendar, school charge and other important matters. The Active School Flag (ASF) is awarded to schools that strive to achieve a physically educated and physically active school community. The process aims to get more schools, more active, more often. To keep up to date with the school's progress , please follow our school's Facebook page. The school is in a position to offer financial assistance to parents / guardians / families towards the costs associated with students starting in a new school and returning for a new school year. New Acting Deputy Principal, School Charge, School Calendar,Book Lists, Book Grant Form,Uniform Sale Dates,School Shoes (Black Polishable Shoes), Uniform Trousers for Senior Students and Summer Holidays. We would like to take this opportunity to wish all our students and their families a safe and pleasant summer. - Uniform for All Years; Time: 6.30 p.m. – 7.30 p.m.
- Uniform for All Years; Time: 11.00 a.m. – 12.00 mid-day. - There are no credit card or debit card facilities available. Cash or cheques can be the only form of payment. - If you are unable to attend the uniform sale, please make an arrangement with a neighbour or friend to purchase the required uniform only on the above dates. - As explained on the book lists, orders or requests for uniforms to the school office will not be processed this year. This information is available under the School Office menu. You can also download the 2017-2018 School Calendar in pdf format in the School Office menu. To view or download the Summer Exam's Timetable 2017 please click here. Today is a very important date for the Salesian Community around the world: The Feast of Our Lady Mary Help of Christians. We would like to wish you all a happy Feast of Our Lady Help of Christians. Mary Help of Christians – Pray for us! We sometimes judge and see ourselves as inadequate, but are still very caring and compassionate towards others. John will help us to see how a corresponding self-compassion is necessary for a balanced happy life. A simple service and reflection in the College Chapel, followed by a Wine & Pizza in the solace to mark this Lenten and Easter season. It is with great sadness that we inform the school community of the death of 5th year student Mark Cummins. Our deepest sympathies to his family, friends and all in our community. We pray that the Lord may have mercy on his soul and grant comfort to his family at this time of Bereavement. to grow in wisdom, age, and grace. Now You have called him to Yourself. and struggle to understand Your purpose. and give him full stature in Christ. who know Your love and praise Your saving will. Today we have celebrated the feast of Don Bosco with mass in our school. We were delighted to have Fr. Michael Casey, the Salesian Provincial in Ireland and Malta celebrating mass along with Fr. Arek, Fr. Richard Ebejar and Fr. Tony McEvoy. 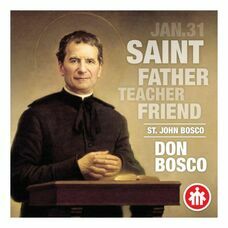 This coming Tuesday 31st January is a very important date for the worldwide Salesian community: The Feast of St. John Bosco,founder of the Salesians. This day will be celebrated in over 130 countries around the world where the Salesian Congregation is working. We are thrilled to reveal that Salesian College have started the process of achieving the Active School Flag. Mr Gavin will be leading the committee to get our school recognised as an Active School.We are looking to be the first secondary school in Kildare to fly the Active School Flag. There are still some tickets available for the Neven Maguire cookery demonstration next Wednesday. The Parents' Association is selling tickets at lunchtime from 12.40 to 14.00 in the school all of this week and also on Monday, Tuesday and Wednesday of next week. Tickets will also be sold this this Saturday morning (11th February) in the school from 11.00 to 12.00. Finally, tickets will be sold on the evening at the door. A number of Late Start Planning Meetings for teachers have been organised over the next few weeks. These meetings are scheduled for Thurs 19/1, Tues 24/1 and Mon 30/1. On these mornings Form Classes will begin for all students at 9:40am sharp. The upcoming 5th and 2nd year Parent/Teacher meetings scheduled for Tuesday 17th January and Monday 30th January have been postponed. These meetings will be re-scheduled in the near future. Application forms for the next block of after-school study starting on Monday 9th January 2017 are now available. Please click on this link to download. Please note the school is not accepting payment until after the 9th January 2017. Christmas Reports have been posted to all students today. Tickets are available from Salesian College. They are €12 for adults, €8 for students and €30 for a family of 4.
students interested in enrolling as a student in Salesian College in September 2017 and their parents/guardians. ● Have an opportunity to meet staff members and present day students of the school. ● Be given a guided tour of the school. ● Be able to get an insight into the various subject areas on offer. ● Gain an overview of the many extra-curricular activities in the school. ● Enjoy light refreshments while viewing a general display of school life around the school courtesy of our Parents’ Association. ● Receive the information pack which includes the relevant application form and school policy documents. ● Deadline for receipt of completed application forms: 3pm on Monday, 21st November 2016. 9.00am-11.00am - Parents and guardians whose son’s surname begins with A through to L for 9.00 a.m. sharp. 11.00am-1.00pm - Parents and guardians whose son’s surname begins with M through to Z for the 11.00 a.m. sharp. Principal's address starts at 11.00am. Rehearsals are well under way for the upcoming performance of “ Oh What A Night “ under the guidance of Ms Tierney, Ms Kelly and Ms Coleman. They have been practising during school, after school and also will be rehearsing over the next few weekends to put the final few touches together. It promises to be a great show and something for us all to look forward to. The show is on from Wed 16th Nov to Friday 18th Nov.
We are also looking for help and support from parents / families / friends. We would be grateful if you are willing and able to sponsor a spot prize which will be part of our raffle. There will also be a programme distributed during the show each night. If you would like to enter an advertisement in the programme to promote your own business and also help the school, please contact the school. The cost of a full page ad is €100 and the cost of a half page ad is €50. Looking forward to hearing from you and looking forward to a great week of entertainment. Quality plants for sale including spring bedding, hanging baskets, shrubs, window boxes. This information is also available under the School Office menu. Today we welcome all of our new first year students to Salesian College. We hope each student settles in well with the help of our Ceangail team. To help you settle in to school we have compiled some helpful information. Please have a look at it by scrolling down on the following presentation. We welcome our new first year students on Thursday and Friday 25th & 26th August. We look forward to an excellent, well organised and welcoming start. Ceangail Team: Evin McGovern, James Killian, Sean Leonard , Donatas Galickas, Paul Hogan, Adam Stenson, Dillon Ryan, Eoin O’Dwyer, Ryan Duncanson & Lee Maycock . Cinnirí Team: Liam O’Flynn (Sport), Dylan Connolly (Sport), Kevin Dunne (PR), David McGivern (PR),Conor Myler (ICT), Adam Curley (ICT), Cian Hayden (Social Awareness), Lee Franzoni (Social Awareness) , Jordan McElroy (Activities) & Daniel Boyle (Activities). More information is available under the School Office menu. On behalf of all the students, teachers and parents of Salesian College who participated in our wonderful Sports Day and BBQ on Tuesday, 17th May, we would like to sincerely thank our local sponsors, Supervalu at St.Wolstans Shopping Centre and Glanbia. Their support is greatly appreciated and valuable. It is wonderful to have support from our local community. Here are some photos of our great day on Tuesday, 17th May. We hope you enjoy them. The school will be closed from Monday 24th June until Monday 22nd August to facilitate staff holidays. School will open only on Wednesday, 17th August for Leaving Certificate results. Results will be available from 10.00 am. Finally, we would like to take this opportunity to wish all our students and their families a safe and pleasant summer. On April 25th we celebrated the centenary of the 1916 Rising with the reading of the proclamation and by raising the Irish tricolour flag. We want to congratulate all students and teachers who participated in these celebrations. Finally a special word of thanks to Mr.McManamon for coordinating this fantastic event. And now a video showing the highlights of our 1916 celebrations! The Cognitive Ability Tests for all incoming first years for 2016-2017 will take place on this Saturday 16th in the school. All students should be at the school for 8.55am at the latest to start at 9.00am sharp. Students should bring 2 HB pencils and an eraser and a light snack for a short break. Congratulations to Stephen Teague who won the Leaving Certificate Biology Quiz in NUI Maynooth. Teresa Redmond (NUI Maynooth) presented Stephen with his prize.....an iPad!! Well done Stephen! As part of the Novena to the Feast Day of Don Bosco, Salesians Ireland presented a daily video showing the living spirit of Don Bosco in Ireland. Our school participated in the Novena by preparing and presenting a video: "Don Bosco as a perfect friend". In this video our students shared and reflected their thoughts on Don Bosco's life and on their experience of Salesian Spirit. Day 1: “Don Bosco is Alive Today” – Part One – Salesian College Pallaskenry. Day 2: “Don Bosco is Alive Today” – Part Two – SAVIO Volunteers. Day 3: “Don Bosco is Alive Today” – Part Three – Salesian School Fernbank. Day 4: “Don Bosco is Alive Today” – Part Four – Don Bosco Care – Dublin. Day 5: “Don Bosco is Alive Today” – Part Five – Heywood Community School​. Great result and well done!! This year we will offer afterschool study from 16:15 until 17:45 and Saturday morning study from 10:00 until 13:00. This will take place from Monday 11th January until Thursday 26th May 2016. The registration deadline for first year students wishing to start in September 2016 is Friday, 18th December. The office is open for registration from 9.00am to 11.30am and from 2.30pm to 4.00pm up until Friday, 18th December. In-house exam reports will be issued this week to all parents. The school is closed for the Christmas holidays. We will re-open on Wednesday, 6th January 2016. The staff of Salesian College wishes you a Merry Christmas. What a great day in Salesian College! The 35th Annual Road Race took place today with nearly 500 of our students taking part. In third place was Dylan Connolly, Dominic 5. In second place was Shane Ferris, Bosco 3 and in first place was Stephen Gavin, Colm 6. Well done to all students and teachers who either took part or helped organise the road race. Finally a special word of thanks to our PE teachers, Paddy McGovern and Colin Cryan, for coordinating this fantastic event. On Saturday 14th November we are having an open day for students interested in enrolling as a student in Salesian College in September 2016 and their parents/guardians. We are delighted to announce that the Annual 1st Year Night In will take place on Friday 6th November from 6:00pm - 9:30pm for all 1st Years. A letter has been sent home with 1st Years. The permission slip along with €12 must be returned to the Ceangail Team by Friday 16th October. This great event is organised by our school leader teams, Ceangail and Cinnirí. This is a very important evening in our first year students lives as it gives students the opportunity to socialise in a relaxed environment with their friends and peers. Entertainment will be provided, including indoor football, table tennis, PS22/X Box and other surprises on the night. Food and drink will also be provided. We commend and thank our student leaders, Ceangail and Cinnirí and wish them well in the organisation and supervision of this annual event. We look forward to a very successful evening. ﻿The Parents Association of Salesian College have hosted the Community Awareness of Drugs course twice in the past . This course will be held this time in St. Wolstan's Community School commencing on 24th September 2015 from 7.30pm to 9.30 pm. The course will run once a week for six weeks.There are spaces available if parents/guardians from Salesian College are available to attend. Parents and guardians can view and download book lists and forms relating to journals, lockers, book grants and the school's voluntary contribution. ﻿Well done and many congratulations to all our Junior Certificate students who received their results today. As the day progressed there was a heightened sense of anticipation and excitement. All students received their results attended a presentation from our Local Juvenile Liaison Officer, Garda Audrey Sheridan. The new school year has begun. We welcome all our new first year students and wish them well. We thank our Ceangail and Cinnirí teams who have ensured they are well looked after and are familiar with their new surroundings. We welcome back all of our other students and wish them every success in their studies and their activities this year. Ceangail Team: Robert Clampett & Jamie Smyth, Conor Doyle & Malo O'Connor, Liam Hanley & Nathan O'Connor, Robert Clarke & Stephen Gavin, Ciarán Wilson & Seán Browne. 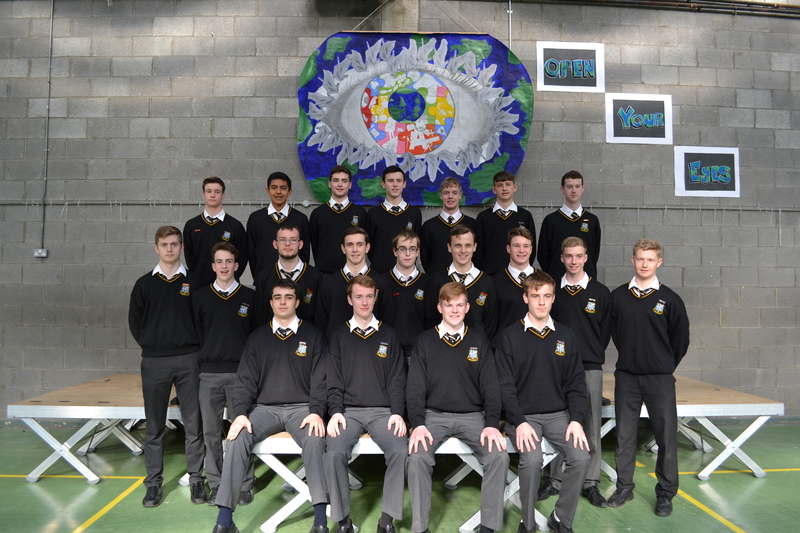 Cinnirí Team: James Smith & Seán Keating (ICT & 3rd Yr), Cristhian Pitiga & Cathal Byrne (Music & 6th Yr), Noel Hendrick & Robbie Cuffe (PR & 5th Yr), Robert Hendrick & Ross Cunningham (Social Awareness & 2nd Yr), Kevin Gorman & Seán McGoldrick (Sports & 1st Yr). The school calendar is now also available for downloading in pdf format. A big welcome to our new 2015 First Year students and their parents/guardians as secondary school life will begin this Thursday, 27th August (First Year students only). We wish them many happy and productive days in Salesian College. Uniform for All Years; Time: 6.30 p.m. - 7.30 p.m. Uniform for All Years; Time: 6.00 p.m. – 7.30 p.m. Uniform for All Years; Time: 11.00 a.m. – 12.00mid-day. NO CREDIT CARD OR DEBIT CARD FACILITIES AVAILABLE, CASH OR CHEQUE ONLY. Uniforms are only available for purchase on these dates, if unable to attend please make some arrangement for your son’s uniform to be purchased on the above dates. Quality plants for sale including bedding plants, hanging baskets, shrubs, window boxes. Transition Year students take to the stage in the Irish drama "Gealt" . - Internet Safety: Friendly Wi- Fi for young people; how to make a smart choice about your young adult’s online safety. -Cyberbullying: An understanding of cyberbullying, what it is, the tools to avoid it and to deal with it. From hundreds of fantastic entries, Dylan Breheny's story (the Golden Dagger) has been short listed as a junior cycle finalist in the "Eason Creates Creative Writing Competition". WE NEED YOUR HELP!! We need each and everyone of you to vote for Dylan Breheny. Not only does he stand to win a great prize but the school will also receive €1500 worth of books so please vote and share the page. The voting closes on 29th April. We thank you for your continued support for your son’s education here with us here in Salesian College. We would like to share our news of the last few weeks and to give advance notice of upcoming event. ﻿We welcome all parents and guardians to our Information meeting on the Transition Year Programme tonight at 7.30pm. We will begin our next rou﻿﻿nd of offers for available places for incoming first years for 2015-2016. Applicants who did not return their acceptance and registration fo﻿rms will﻿ be contacted and a copy of their application returned. All applicants who have not heard from the school to date will be contacted before the ﻿end of the month﻿. Bicentenary Celebrations of the birth of Don Bosco, founder of the Salesian Order 1815-2015 - An invitation to celebrate. We welcome back all our students following the Christmas and New Years holidays. All studen﻿﻿ts received their reports before the holidays and we hope all will reflect on their work and levels of study required to improve their results. Afterschool study will be﻿gin next week. A﻿pplication forms are available from the Dep﻿uty ﻿Princip﻿al's ﻿office. We strongly encourage all Junior and Leaving Certific﻿ate students to a﻿pply. It is well worth it and with the mock exams this term supervised study is a very good opportunity for students to study and work in a calm and focused environment. We thank all parents and guardians who have returned their acceptance forms and completed registration forms. As explained in our Admissions Policy applicants who were sent an offer in the first round and who have not returned their acceptance and registration forms by 3pm 19th December, will now be deemed t﻿o have forfeite﻿d this offer and these places will now be offered in our next round. We look forward to contacting parents and guardians in the New Year. We have begun our registration process for first year students 2015-2016. All applicants will be contacted in relation to their application before the Christmas holidays. As of Monday 10th November 2014 the Board of Management of Salesian College has ratified a new Admissions Policy. This policy supercedes all previous policies. All applicants to Salesian College for first year 2015 will receive a copy of this policy with the Information pack. The new Admissions Policy is available from the school office. We are delighted to announce the annual first year night in will take place on Friday 10th October. This great event is organised by our school leader teams, Ceangail and Cinnirí. The event will start at 6pm until 9.30. We ask parents/ guardians to make sure you come to the school at 9.30pm sharp to collect your son. This is a very important evening in our first year students lives as it gives students the opportunity to socialise in a relaxed environment with their friends and peers. Entertainment will be provided, including indoor football, table tennis, PS22/X Box and other surprises on the night. Food and drink will also be provided. The cost is €10 per student and this money must be paid in advance along with the permission slip which has been given to all students to their Ceangail leaders. We commend and thank our student leaders, Ceangail and Cinnirí and wish them well in the organisation and supervision of this annual event. We look forward to a very successful evening.